Some of our respondents have objected that the preceding post on the self-abolition of the poet assumes, wrongly, an essential link between the poetry and literacy. This is a good point, and one we had intended to address eventually. Oral poetry has, it’s true, existed alongside and inside literate poetry for thousands of years, and there is every indication that poetry — defined broadly as the patterning of speech — is a primordial set of mnemonic techniques that cultures have used to transmit and conserve important information since long before the advent of writing.But the point of the earlier post was to demonstrate that the emergence of poets and poems — particular authors attached to particular written creations — was a product of literate class societies, societies with a complex division of labor, with something like a state and with a division between commoners and elites. We’re going to stand firm on this point, with the added complication that, in many cases, the poetry that played the role of glorifying, consecrating and mythologizing such class societies was also oral (see, for instance, the Bardic tradition). In this regard, the presence or absence of writing is not really determinative it’s merely an index. What’s determinative is the social form. This is one of the reasons why poetry can itself never be a program for the abolition of poets and poems (we intend to say more about this point in a subsequent post). If we can speak of a popular or folk poetry before the modern period – a poetry of the commoners rather than the elites – it was not only unwritten but fundamentally authorless. 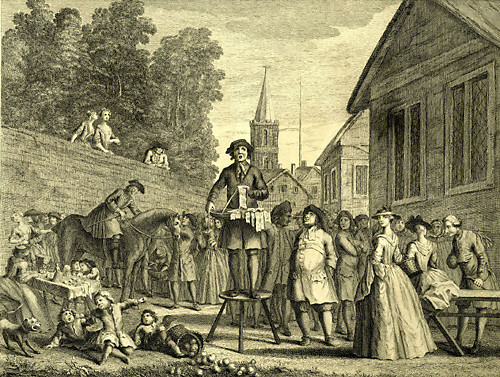 The virtuosic balladeer, to give one example, may have been celebrated for his or her unique capacity to ring a change upon time-tested stories and myths, but these latter are seen as the product of a society, a community, and certainly not the individual singer. In a repertory cultural practice of this sort, there is little possibility of the sort of posthumous recognition that one gains with literate cultures – no fame, no posterity, as it were. Only the work and its subject lives on: Robin Hood, for instance, as popular hero, emerges as individual character out of the collective, iterative retelling of a community of balladeers. And it is in this sense that we would suggest that the terms “poet” and “poem” as they are used now do not capture very well what is happening in such folk traditions. Whoever signed the name of Homer to the oral-formulaic cultural material of a community of singers and bards effectively transformed that material into the property of an individual, a poet. Poem is one of the names we give to cultural material once it has become property. There is no going back, not even if we wanted to (which we don’t). That’s the first rule of history. We would not want the above remarks to suggest the possibility of romantic return to a pre-history that was certainly oppressive and ugly enough as it was. But knowledge of these folk traditions does help to denaturalize our sense of what poetry is, and gives us, as a result, a much better sense of the possibilities for patterned language under entirely different social conditions. What would happen to poetry in a society in which there was a fundamental equality of opportunity and equality of access to the means of cultural expression? Poetry would no longer be a restricted domain, accessible to the few, to those with the resources, or the good fortune, to find their way to the Parnassian foothills. The equalization of access – of free time, essentially - would have profound and far-reaching effects, we think, on the social status of aesthetic activity, which would instantly become the possession of the many, rather than the few, even if there were no generalization of inclination or talent. In a situation where there are as many writers as there are readers, collaborative, iterative and collective production of text seems as if it would present the more logical choice. Let’s imagine, too, a human community in which what one took from or gave to the social store was entirely voluntary and regulated by nothing so much as one’s sense of belonging to a community. In this situation, one would likely no longer experience the social field as a regulative and even violent force that stood over and against one’s individual freedom, but as the fundamental precondition of such freedom. Likewise, the individual would no longer appear as a variation played upon a general type – man, woman, poet, carpenter, whatever. Rather, each individual would present as absolute singularity, as specificity belonging to no general category, a unique actualization of social possibilities; any conjunction of individuals would likewise be unique. There would be no need to seek out distinction by way of difference as happens in capitalist society, since distinction and singularity would be the given of social life. The quest for recognition that animates so much poetry would be meaningless. If we imagine poetry surviving in such a set-up – but not poets or poems – it’s because poetry is likely to emerge as the creation of these unique conjunctions of singular individuals, under conditions where social interactions are animated by collaboration and cooperation rather than competition. The mode of address of poetry would likely be radically different as well, since the distinction between public and private spheres, bound up as it is with the distinction between free and unfree activity, will have disappeared. Poetry might become both more intimate and more social all at once. In a subsequent post, we will to return to what all this means for poetry today. Until then, we will simply conclude by stressing that the foregoing speculations have no reality except as the horizon projected by the contradictions within the society we live in today. They are not soothsaying. They are a possible (but by no means definite or even likely) future. Such speculations are future relative rather than future perfect. They are aspects of the present, speculations we can make on the basis of what we know now, and in that way they are also negative descriptions of the present. That’s part of their value – the shadow they cast on the present. This holds as much for today’s capitalism as for today’s poetry.